After the success of PROGRESS’ biggest show ever at the Brixton Academy, they return to the more humble setting of the Ritz in Manchester to begin a new phase of their existence. We’re now on the road to Orlando, PROGRESS’ next ‘big show’, but before then, new champions Mark Haskins, Rampage Brown and British Strong Style must be cemented, and several new faces must be debuted. This show feels like a fresh start for the promotion after some strong but fairly stagnant cards in the build-up to Brixton. Who will stand out now that there are more opportunities open at the top of the card? Bubblegum has been hanging around in PROGRESS for a while as an occasional jobber to the stars, but has the potential to move up the card post-Brixton. Mambo looks like he’s becoming more of a regular now too, and is getting some necessary experience on the bigger stage of Chapter shows as well as working for other promotions around the country after spending most of his first three years in wrestling only on ENDVR cards. Indeed, Mambo looked a lot more confident here than ever before and had his best singles performance that I’ve seen from him. Both women were making their PROGRESS debut here, but obviously KLR figures to be sticking around instead of import Kimber Lee, and this match was designed to make her look as deadly as possible. The first section of the match was particularly well wrestled, with both wrestlers showing very impressive technical prowess, before KLR went for her first guillotine of the match. Lee fought out but KLR aimed to get back into the guillotine at every opportunity throughout the match. I’ve never seen much of Kimber Lee, and while I was very impressed with her early, she got worse as the match went on, and her sequence of sloppy suplexes didn’t land with me at all. Two exciting debuts here, with James Drake, a Futureshock Wrestling guy who impressed PROGRESS management with his performance at a recent ENDVR show, and Fabian Aichner, who had a surprisingly great performance in his one and only CWC match against Jack Gallagher. Aichner’s WWE appearance gives him immediate star power and credibility, but his in-ring talents are more than enough reason to see him back in PROGRESS and appearing for plenty of other European promotions soon enough. 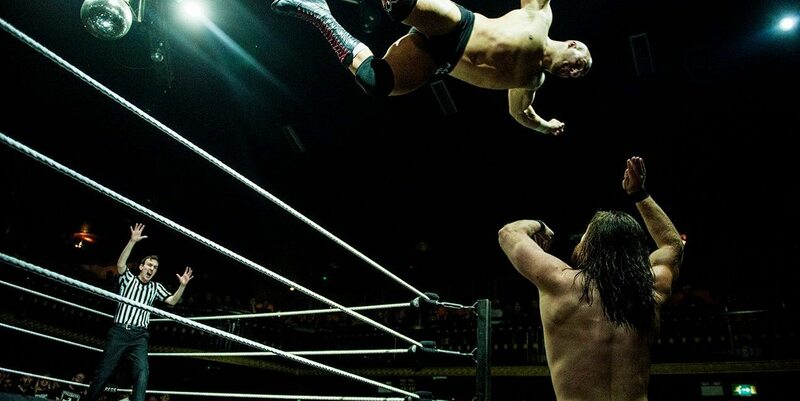 The man can do some amazing things, as he proved in this match, with numerous aerial moves executed so beautifully despite his size, highlighted by a huge top rope dive to the outside with dazzling hangtime. Aichner gives off Cesaro vibes, and that’s not just because he’s from the same part of the world and is bald. Trent Seven was a replacement for Shane Strickland in this match, after Strickland’s falling out with wXw the night may or may not have affected his ability to work this show. 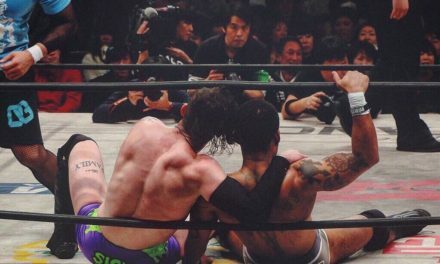 This at least gave Seven the chance to take a hilarious shot at the ‘fake Strong Style’ fans of PROGRESS; Seven has a unique, laid back charisma in his promos that make him innately watchable. He even looks cool while miming wanking. Seven’s addition was probably supposed to make this match a lot more hard hitting, but it ended up not only surprisingly fast-paced and spotty but also more of a comedy match than anyone could have predicted, in part accidentally thanks to Seven’s quirky charisma. While attempting to initiate a double team move on Coffey with his British Strong Style partner Pete Dunne, he called for “Peter” to come help him. The crowd latched onto “Peter”, chanting it for the rest of that match, and the wrestlers adapted the match to it, with Pete Dunne firing up after being laid out as the crowd chanted his (sort-of) name. Dunne is even printing ‘This is Peter’ shirts now with his face in the middle of the PROGRESS logo. Wrestling is weird. Post-match, Scurll began to moan about losing his Championship at Brixton and boasting that he would become a 3-time Champion soon enough, prompting Jimmy Havoc to emerge through the crowd and deck him with an Acid Rainmaker, before nonchalantly leaving immediately after. Havoc and Scurll are going to meet soon enough, and that match will be as close as you can get to a British dream match from the current crop of wrestlers we have. After surviving a ‘disbands’ stipulation at Brixton, The Origin have gone a little bit strange. El Ligero and Dave Mastiff’s obsession with themselves has morphed them into ‘The Banter Squad’. It’s an interesting move for the arch-heels of PROGRESS to essentially play up to the crowd and invite them in on the joke. They even threatened to turn face in this match, with the crowd eating up Mastiff’s ‘Banter Crown’; a beer-chug hat with four Fosters cans on top. Naturally, his offering the New Zealanders SPPT some (fake) Australian beer did not go down well, and neither did SPPT slapping the cans away, drawing the ire of Eddie Dennis, who vows never to let a beer be spilt. Whiplash as the Open Challenge respondent induced a massive groan from me, and probably most of the Ritz as well. He was damaged goods in PROGRESS months ago, and is easily the most uninteresting wrestler on the roster now that Sebastian is out injured. Whiplash is clearly trying to change things up in an effort to get out of the funk he’s in; he’s tried out different attires and here wrestled without his signature fishnets, and is also changing up his wrestling style from show to show, but the writing’s already on the wall. Just like Poochie, Fetch and Roman Reigns, Mikey Whiplash is not going to happen. At least Whiplash’s wrestling was more exciting in this match than his diabolically boring performance against Mark Haskins two Chapters ago. He was back to throwing himself around the room and taking risks, making himself look like a dangerous opponent to Rampage in the isolation of this match. Sadly, his booking has sunk any legitimacy he had coming into this run with PROGRESS, and no-one believed that he was a threat to take the title from Rampage. The final few spots of this match were genuinely impressive, with Whiplash hitting a maverick dive over the top rope, before Rampage caught him attempting the Kyle O’Reilly/Dean Ambrose rope rebound and lifted him up into a Piledriver, ending the match. Haskins won the Championship in the Brixton main event, but played second fiddle to Jimmy Havoc’s return in terms of the big news at the end of the show. In this match too, Haskins was a bit anonymous compared to his opponent. Zack Gibson’s heat has built to nuclear levels in the past few months, and his ultra-long pre-match promo that he’s established so well as a heat magnet made Gibson the main focus of this match. The early going of the match was slow and seemed designed to let the crowd really lay into Gibson as he controlled Haskins. This isn’t to say the crowd didn’t get behind Haskins, but it felt like when they did, they were rooting against Gibson rather than out of an overwhelming support of Haskins. There were even a lot of pro-Gibson chants duelling with Haskins ones. Haskins got those kinds of reactions in midcard matches, but are people buying into him as the PROGRESS Champion yet? While the opening was slow, the match really picked up later on. Both men used their size mismatch really well, with Gibson hitting a few more power moves than usual, and Haskins throwing himself around the ring, and out of it, with aplomb. There were some very dramatic submission spots late on, including a believable Shankly Gates false finish. 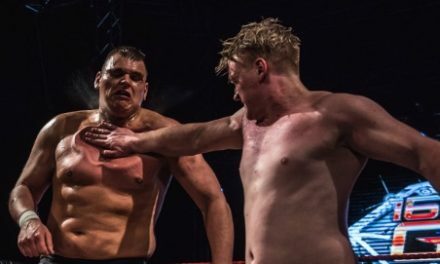 Haskins found a way out of it though, and got on a run of offence that ended with him locking in a sharpshooter, earning the submission victory. 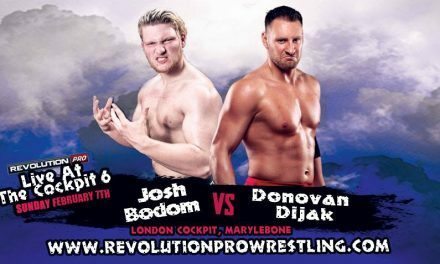 The first post-Brixton PROGRESS show felt very fresh, with lots of new talent being featured and very little in the way of overbearing storyline affecting the matches. The focus was the wrestling, the winners and the losers, with no looming ‘big show’ affecting things. Pretty much everything on this show was enjoyable, so while there were no great matches either, it was a fun and easy watch that I fully recommend. NextThis Week In Ring of Honor: October Recap, Attendance Issues, & More!